Thanks to our partnership with Chinese consultancy outlet Cedars, we can share with you today detailed data for light commercial vehicle sales in China in November. Over the month, minivans are down 36.4% to 30.879 units leading to a year-to-date volume down 19% to 477.969, micro pickups are also down 8.4% to 43.151 and down 1.1% to 530.880 so far in 2017 but pickups continue to shine with deliveries up 32.1% to 41.587 in November and up 17.9% to 363.456 year-to-date. As it has been the case every month this year, the Wuling Mini Truck is the most popular LCV in China but sees its sales thaw 13% to 20.315. It is the only vehicle to lodge a five-digit sales figure this month. The Great Wall Wingle 5 is up 15% to land in 2nd place and now rank #4 year-to0date, overtaking the Wuling Sunshine (-53% this month) and Dongfeng K-Series Mini Truck (+26%). The Wuling Hongguang V rounds up the podium but drops 54% year-on-year. 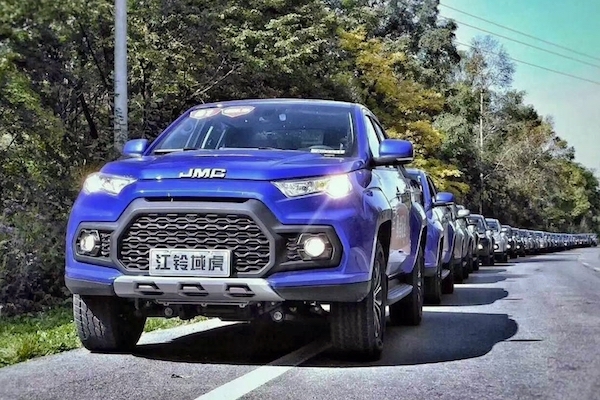 Another great performance by the JMC Yuhu whose new generation pushes sales up 60% to #2 pickup in the country and #7 overall, the ZX Auto Grand Tiger (+49%) and JMC Baodian (-3%) lurk just behind. Notice also the Jinbei Mini Truck up 82%, the Great Wall Wingle 6 up 74%, the Jiangxi Isuzu Ruimai up 67% and the FQT Motor M70 up 9-fold on a year ago.